Chavis was one of new Razorbacks coach Chad Morris’ most important hires this year. The former A&M, LSU and Tennessee assistant coach has nearly 30 years of experience working in the Southeastern Conference, winning a national title with the Volunteers in 1998. The 61-year-old Chavis long ago established himself as one of the premier defensive coordinators in college football, a reputation built on a philosophy of constant quarterback pressure and organized chaos on defense. “He’s just an aggressor,” Agim said. Now Chavis takes over an Arkansas team mired in one of its worst six-year stretches in school history, capped by a 4-8 record last year that led to the firing of former coach Bret Bielema. Among the many things that went wrong for the Razorbacks a year ago was a defense that was 114th in the country while allowing 36.2 points per game. Their defensive struggles came despite Bielema’s traditional approach that tried to slow down games and limit the number of opponents’ plays. Still, Arkansas allowed 6.45 yards per play — 119th in the country — and its bend-but-don’t-break approach left many players frustrated by inactivity. No more under Chavis, whose name is synonymous with blitzing across the SEC. 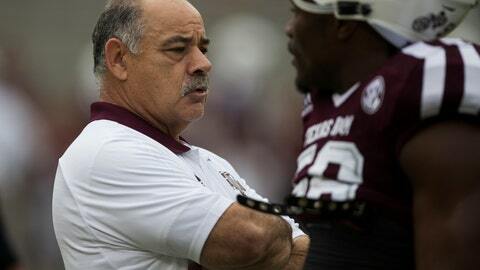 Chavis won the Broyles Award while at LSU in 2011, earning the recognition as the country’s top assistant coach. While at Texas A&M, his method of generating pressure on opposing quarterbacks continued to work — with the Aggies finishing in the top 25 nationally in sacks in each of the last three years. However, despite finishing with an SEC-best 43 sacks last season, Texas A&M’s defense still allowed 30.7 points per game, 87th in the country. Those defensive struggles were part of the reasons behind the firing of former Aggies coach Kevin Sumlin after last season, leaving Chavis feeling like he has plenty to prove in his new job at Arkansas. He takes over a defense that knows that feeling of wanting to prove doubters wrong well. Chavis said one of the most important reasons he was interested in the job was because of Morris, who he said was “one of the best offensive coordinators I ever went against.” When he was hired, Chavis also said he believed the Razorbacks could win a national championship. “It’s not going to happen overnight, but we’re going to build a championship program here at Arkansas,” Chavis said. That kind of confidence has been in short supply around Arkansas since the Bobby Petrino scandal and his firing in the spring of 2012. With Chavis’ fearless approach leading the way on defense, a lack of swagger doesn’t figure to be a concern any longer in Fayetteville. “With coach Chavis, he’s bringing all pressure,” Arkansas senior linebacker Dre Greenlaw said. “It might be third down, second down or first down, it doesn’t matter. When coach Chavis feels like calling a call, he’s calling that call and he’s going to roll the dice.